As the name suggests, Portsmouth South covers the southern part of the city and is represented in parliament by Independent Mike Hancock (Formerly of the Liberal Democrats). Gerald Vernon-Jackson was the Leader of Portsmouth City Council for ten years. He led the city through turbulent times but also where the city made real progress. He successfully worked to stop the last Labour Government pulling the Royal Navy out of Portsmouth when this was threatened in 2008. He campaigned to keep the carrier programme from being scrapped by the current Government. This will see the new carriers based in Portsmouth and the future of the Navy in Portsmouth guaranteed for the next 40 years. This will see thousands of jobs secured in the dockyard. He pushed through a £1.6 million loan from the City Council to the Portsmouth Supporters Trust to enable them to buy the Football Club and stop it going into liquidation. Under Gerald Vernon-Jackson’s Leadership the Liberal Democrats ran Portsmouth City Council for ten years. They found £5 million to build new school classrooms for an extra 1,000 pupils. They started building council houses for the first time in a generation. They saved the Kings Theatre and the New Theatre Royal from closing down. Gerald also spearheaded the campaign to get a World War Two War Memorial finally built in Portsmouth to commemorate the 3,000 Portsmouth citizens who lost their lives in the war. Now Gerald leads the Lib Dems as the largest group of councillors in Portsmouth, against the Conservative led administration voted in by Labour and UKIP councillors. 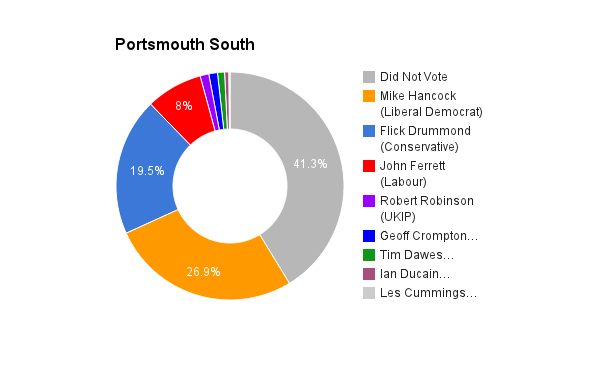 Portsmouth South is a seat that for 100 years has only ever voted in a Liberal Democrat or a Conservative MP. I’ve been a local councillor in Portsmouth for 12 years. This means that I am on the ground and speaking to residents on a daily basis. I try to get out and speak to people on the doorstep at least four times a week. If elected, this will become more difficult but I still intend to go out and speak to people in Portsmouth every weekend. I’ve got a strong record of delivery for the people of Portsmouth. As Leader of the City Council, I fought hard to keep Navy here in Portsmouth when the last Labour government threatened to close the Naval Base, I ensured we found over 1000 new much needed primary school places and continue to work hard to create jobs. For the 10 years between 2004 and 2014 when the council was run by the Lib Dems employment increased by 9.2% with real wages increasing by 4.4%. I think it’s really important we have a local MP who has shown they will work hard for the city. When the current Member was a Liberal Democrat, he was a part of the campaign to keep vascular surgery at QA Hospital. This was and still is essential as we need the best quality health care provision here in Portsmouth. Portsmouth residents should not have to travel to Southampton for surgery which can and should be done here in the city. It is really important that we are a country that lives within her means. The economy has grown under this government. In Portsmouth, we have seen private sector jobs replacing the public sector jobs we have had to cut back on. In government, the Lib Dems have created a million private sector jobs and hope to create a million more. In the last 10 years, real wages have increased by 4.4%. Immigration must be properly policed with the government knowing exactly who is entering and leaving the country. That is why the Lib Dems are campaigning to bring back proper exit checks. However, we cannot close the gate entirely. The majority of people coming to this country are here to work and here to contribute to our economy. We must actively work towards everyone receiving the Living Wage. I’m campaigning locally to get the council to pay at least the living wage to all of its employees. In government, the Lib Dems have given millions of people an £800 tax cut as well as saving families £473 a year thanks to the introduction of free school meals for all infants. We must keep the healthcare free at the point of use. I think it is really important that the best healthcare for the patient is available. The Lib Dems are the only party who have committed to the extra £8billion needed for the NHS by 2020. We must ensure we are providing opportunity for everyone to get on in life. This means making available different routes into employment other than the assumed route of school, college, university, graduate job. In government, the Lib Dems have created over 2 million apprenticeships including 7070 in Portsmouth. Apprenticeships are a great way for getting more young people in to work. Yes, I believe it does. Far too many MPs have come through the same route of having never worked in the real world. Too many MPs have gone to University and gone straight into working for an MP or a political party and then gone directly onto being selected as a Parliamentary candidate. I think we need more MPs who have worked in the real world before entering politics. I’m very much in favour of a referendum on the UK’s membership of the EU. I would actively campaign to keep the UK in the European Union. In a world with terror threats being so real, I think it is so important that we are a country which actively seeks to work closely with our European neighbours. I also think that for Britain to be able to stand tall in the world, we must stand tall in Europe by working actively with other European countries from within the EU rather than moaning from the outside. The EU encourages the politics of collective working and solving the global problems we cannot solve on our own including financial crises as well as climate change and global warming. The EU countries are also our main economic allies as our largest export and import market. In Portsmouth, there are thousands of jobs reliant on the UK being in the EU – especially with our International Ferry Port and fruit importing business.